Slice bread into 1/3" thick slices on the diagonal. Place the bread slices side-by-side onto a large baking sheet. Brush the tops with butter. Flip the breads over and brush the other side with butter. I just use long strokes across multiple slices of bread at the same time. Bake at 350˚F for 5 minutes or until edges are just barely starting to turn golden. The breads should still be soft in the center. In a small bowl, combine all of your spread ingredients: 8 oz cream cheese (no need to soften it), 2 Tbsp Mayo, 1-2 pressed garlic cloves, 1-2 Tbsp freshly chopped dill. Mash it all together with a fork. Spread the cream cheese mix over the top of each bread slice. It's OK to spread even if the bread is still warm. 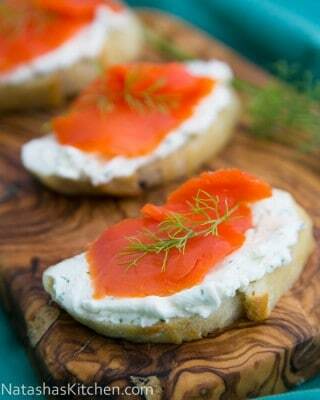 Top with a piece of salmon and garnish with dill. If stacking, it's a good idea to put plastic wrap between the layers so the bread doesn't get soggy. If your bread is very fresh and soft, you don't need to brush with butter and bake.